WASHINGTON – On November 11, 2013 the nationwide Japanese American Veterans Association (JAVA) donated $17,500 to The Honor Flight Network (HFN) through JAVA’s “Giving Back Program,” a new fund supporting a veteran’s charity. This new fund is comprised of approximately 100 donations received from JAVA members and friends. Checks in this amount were presented by JAVA President Gerald Yamada to James McLaughlin, Chairman of the Board of HFN at the JAVA – National Japanese American Memorial Foundation 13th Annual Veterans Day Program at the Japanese American Memorial to Patriotism. 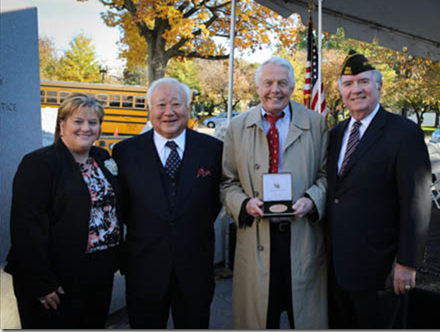 Yamada also presented HFN with a bronze replica of the Congressional Gold Medal (CGM) that was presented to the 100th Battalion, 442nd Regimental Combat Team and the Military Intelligence Service (MIS) on November 2, 2011. Diane Gresse, Executive Director of HFN, accompanied McLaughlin. Gregory Laughlin at Memorial to Patriotism. Photo by Bruce Hollywood. “This “Giving Back Program,” is an extension of the Nisei legacy,” said JAVA President Gerald Yamada, who explained a debt of gratitude owed to the Nisei soldiers who served in the 100th, the 442nd, and the MIS. “The Program extends a helping hand from those within JAVA who have benefited from the Nisei soldiers legacy to those in the larger military community who are in need,” said Yamada. In November 2011, HNF assisted 150 World War II Nisei veterans, many in wheel chairs and assisted by oxygen, with their travel costs, so that they could attend the Congressional Gold Medal Award Ceremony at the US Capitol and other associated events, including a visit to the World War II Memorial. In addition to arranging airline transportation, HFN arranged to have each veteran given VIP departure and arrival amenities and to be recognized during the flight by the pilot, who singled out the veteran by name and described the Nisei role in WW II. Nisei veterans were deeply touched by this unexpected recognition. During the ceremony, keynote remarks were presented by The Honorable Gregory H. “Greg” Laughlin, Colonel, U.S. Army Reserve, retired, member of the U.S. House of Representatives (1989-1997). Laughlin is the only member of Congress who served on active duty during Operation Desert Storm. In his key note remarks, Laughlin expressed his appreciation for his friendship with former Congressman Norman Mineta, with whom he served in Congress and who was in the audience. Laughlin spoke about (1 ) his respect for the Nisei soldiers who rescued a battalion of the 36th Texas Division that was trapped by the Germans in the Vosges Forests of northeastern France, (2 ) what they accomplished in the face of harsh discrimination at home, and(3 ) the importance of the Japanese American Memorial to honor the valor of the Nisei soldiers. As a Congressman, Laughlin represented the district that is home to the “Lost Battalion”. During a conversation, HFN Executive Director Gresse described the HFN as follows: The HNF “is a non-profit organization created solely to honor America’s veterans for all their sacrifices. HFN transports our heroes to Washington, D.C. to visit and reflect at their memorials. Top priority is given to the senior veterans – World War II survivors, along with those other veterans who may be terminally ill. Of all of the wars in recent memory, it was World War II that truly threatened our very existence as a nation—and as a culturally diverse, free society. According to the Department of Veterans Affairs, an estimated 640 WWII veterans die each day. Our time to express our thanks to these brave men and women is running out.” HFN has begun to transport Korean War veterans to WDC.